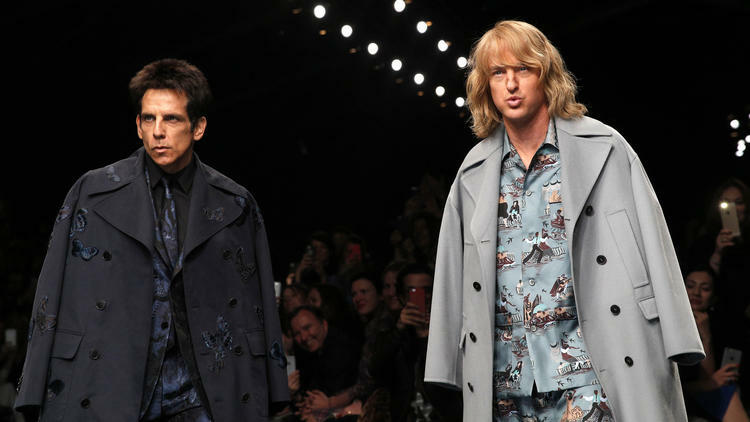 During the finale of the Valentino Women’s Fall/Winter 2015 Collection in Paris, Derek Zoolander (Ben Stiller) and Hansel (Owen Wilson) appeared out of nowhere to a stunned, amazed and camera phone snapping crowd. The majority of the show featured lavish Valentino dresses, luxurious black boots, stylish handbags and classy models. Then Zoolander and Hansel came out in some pretty fancy clothes. Derek wearing a dark blue brocade suit and black creeper shoes, Hansel in light blue island flavored pajamas with a cashmere coat and bright white Kicks. As you can see above, Ben’s still has the Blue Steel stare going on and Owen’s doing his best playful model look. The instagram shots courtesy of Maisonvalentino get even better. 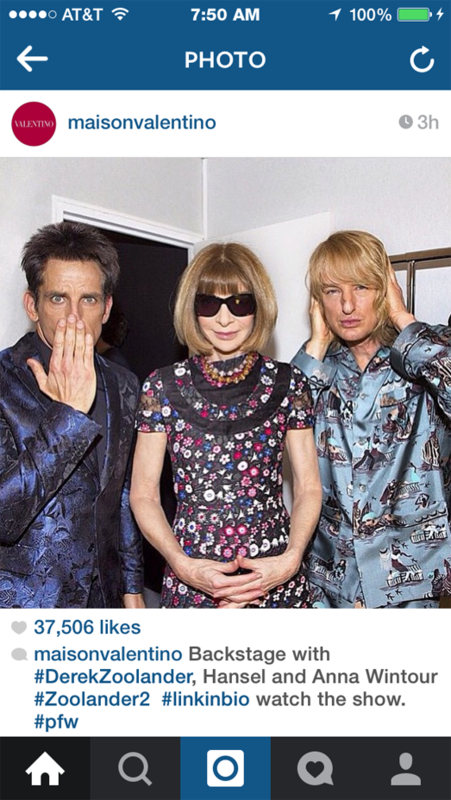 See below as they pose with a SMILING Anna Wintour! 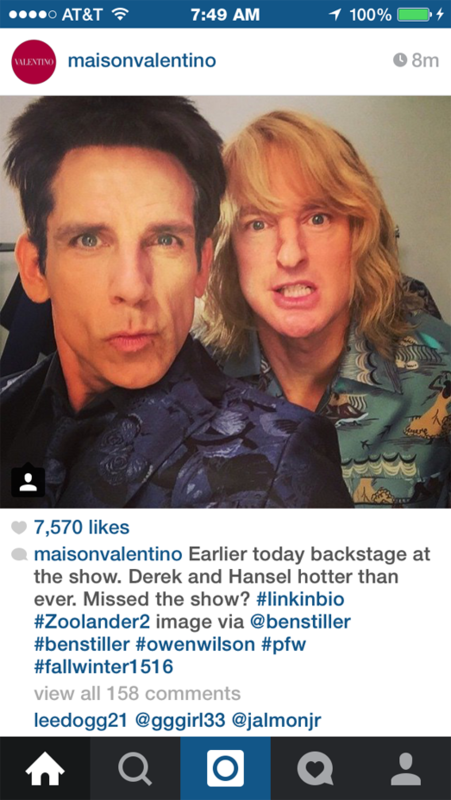 The fashionably fun stunt is to promote Zoolander2, hitting theaters on February 12, 2016. Stiller and Wilson will star with a few of their famous friends. The movie is written by Justin Theroux and directed by Ben Stiller. The original Zoolander came out in 2001, I actually have it at my condo on video tape. No longer able to watch it in our digital world. You should be able to see the entire fashion show here. I was able to watch it earlier Today/Tuesday March 10, 2015. Posted on March 11, 2015, in Cool, Fashion and tagged Ben Stiller, Blue Steel, Fashion Fun, Fun Stunt, Hansel, Owen Wilson, Valentino, Zoolander2. Bookmark the permalink. 4 Comments. 2016 can’t get here soon enough. If you know me then you know that this is one of my favorite movies EVER!!!!!! Thank You for the nice Reblog on A Mans Guide. One of my favorite movies too. Can’t wait for the 2nd to come out, bet there will be lots of fun cameos in it. This would seriously be amazing!